Members of No 5 Area National Coal Board Civil Defence Team travelled on Saturday, to the Home Office Civil Defence Training School, Falfield, Glos, to defend their title as National Champions at the finals of the Industrial Civil defence competition. This feat they successfully accomplished by beating their opponents, London Passengers Transport Board by 478.1/2 points to 345.1/2. 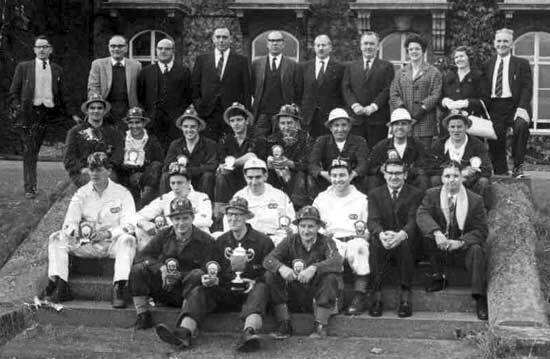 The competition is organised by the society of Civil Defence offices and is acknowledged as the premier award of Great Britain. No 5 Area can feel justly proud of their team, and great credit is due to the instructors, Mr. L. Storey, the Area Civil Defence Office, and his assistant, Mr K.F. Winfield, for training the team to such a high standard of perfection. This team, which comes from all parts of the area and from practically every unit in No 5 Area, embodies the whole essence of team spirit. To reach the finals of this most difficult competition is a hard road, stretching over a period of 18 months and eliminating teams from all over Great Britain in the process; teams representing all sides of industry such as Lever Bros, Gibbs S.R,. Steel Co. of Wales, British Oil and Cake Mills amongst others, all have succumbed to the skills of this N.C.B team. Our photograph shows members of the team together with officials after the presentation of the coveted trophy. Photograph reading from left to right.- front row T.K.Newton, C. Leivers, J.H. Rowe. second row B. Thurman. A. Brown, M. Marriott, A. Hutsby, D. Thompson, D.A. Plumb. Third row: D.Milward, P.Wardle, K. Middleton, P.Turner, M.Haywood, H.Moore, R. Young, J. Sansome, back row; V. Welburn, K.F. Winfield, (Instructor), Mr.E. Groves M.B.E. (Divisional Civil Defence Co-ordinator), Mr J.A. Wood (Deputy Area Production Manager), W. Barrowcliffe, W.A. Allen (Assistant Area Safety Engineer), Mr.S. Hayes (Area Safety Engineer), Mrs S. Hayes, Mrs.L. Storey and Mr.L. Storey (Area Civil Defence Office).